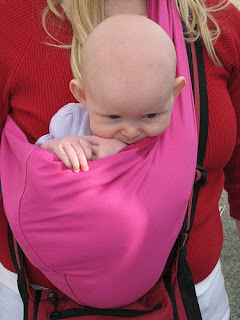 When my children were babies I found great joy in carrying them around in the Baby Bjorn carrier. To have this warm little bundle so close to me, where I could gaze into her eyes, and know she was safe, warm and comfortable was a great comfort. It was so convenient too; no stroller to lug up stairs, lift into car boots or maneuver into tight spots. When the babies were a little older and had more neck control I turned them around so they were facing the world and could see what was going on. The little legs and arms would bounce along merrily and they would giggle as I tickled their feet as we walked. Nowadays baby carriers and slings come in a dazzling array of colours, fabrics and designs. There are so many funky styles to choose from that the decision to buy the right one for both you and baby can be daunting. It must be comfortable, for both of you but also easy to use and adjustable. And are there real tangible benefits to carrying your baby rather than pushing him or her around in a stroller? If you would like to know more about carrying your baby, Sandra Versele, at Parentlink is running a fun 2 hour workshop on 14th July, 2009. You will learn about the basic baby-physiology and safety rules regarding carrying as well as different ways of carrying, with a demonstration of different designs of slings, mei tais and wraps. You will discover the different fabrics and shapes available to help you decide what the best solution is for you. Sandra Versele, mother of four, doula and childbirth educator, is also running a workshop on raising your baby in a green environment. Learn about disposable diapers, toxic free plastics, toys and furniture, and which clothes and skin care products that are safe to use for your baby. You will leave with lots of practical advice on what you need for your baby in the first two year. Thank you Millie!!!! I like the pic!